Renault India, the fully owned subsidiary of the automobile company has introduced a limited edition of its best selling SUV Duster in the country. It is based on the 85PS diesel RxL Plus platform without any mechanical changes. The Renault Duster 1 Lakh Edition trim is powered by the same 1.5-litre, K9K diesel engine, which belts out a maximum power of 83.8bhp in combination with a peak torque of 200Nm. This trim is introduced with exclusive features like an infotainment system with steering mounted audio controls and Bluetooth as well. In terms of safety aspects it gets dual front airbags along with anti lock braking system, electronic brake force distribution, front fog lamps and key less entry. In addition to these, this trim is also blessed with a rear wiper and defogger. Apart from these, it has all the features that are standard in RxL plus variant. This exclusive variant is available with special offers like attractive EMI of Rs. 8400, additional 2-years of warranty and a free 4-year roadside assistance, which certainly adds to its advantage. This newly introduced trim looks similar to the existing variants as there are no cosmetic changes. To begin with, the rear profile has a distinct look with wide and bold stance. The taillight cluster look tiny but it comes equipped with high intensity lamps and turn indicators. It surrounds an expressively crafted tailgate, which is decorated with a thick chrome applique that has 'DUSTER' lettering on it. The rear bumper has a dual tone look, which is further equipped with reflectors and a chrome plated exhaust pipe. Its side profile has an adventurous look owing to the muscular wheel arches and door side sill. Its external wing mirrors as well as the door handles are in body color, while the window sill surround gets a black finish. This trim is blessed with a set of conventional steel wheels featuring full wheel covers, which are further covered with 215/65 R16 sized tubeless radial tyres. The best part about the exteriors is its aggressive front facade, where the dual barrel headlight cluster gives it a dominating look. The front radiator grille has three vertically positioned slats and the company's insignia, which are treated with chrome. This variant also gets a pair of fog lights as well. 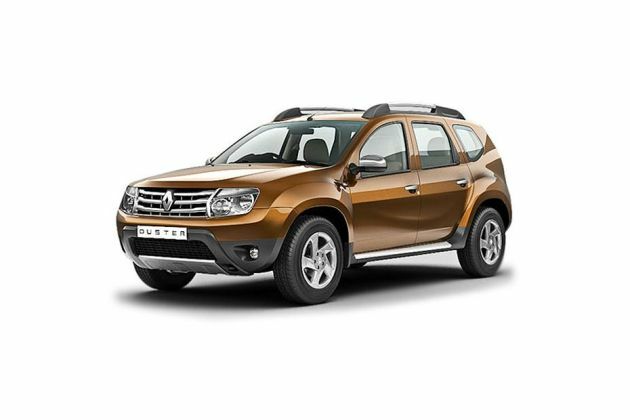 The interiors of this Renault Duster 1 Lakh Edition trim are done up with a trendy beige color scheme, which is complimented by metallic finish inside. The seats are wide, well cushioned and have been integrated with head rests. They are covered with premium quality beige fabric upholstery. The rear seats have back folding facility, which allows the passengers to increase the boot storage capacity. Its dashboard has a beige and piano black color scheme, which is equipped with an advanced infotainment system along with several other utility aspects. The steering wheel has three spoke along with Bluetooth call and audio control buttons, which enhances the driver conveniences. The car maker has also installed an on-board computer that features several information based functions like digital clock, tachometer, tripmeter and so on. This trim gets several utility based features like accessory power sockets, door grab handles, rear AC vents with independent blower control, cup holders, front map lamp, electric back door release and several other such aspects. This variant is powered by the same 1.5-litre, K9K diesel motor that has common rail fuel injection system. It runs on DOHC valve configuration with four cylinders and 16-valves that displaces 1461cc. This diesel motor can produce a maximum power of 83.8bhp at 3750rpm that results in a maximum torque output of 200Nm at just 1900rpm. It is paired with a five speed manual transmission gearbox that transmits the torque output to the front wheels and enables it to deliver a peak mileage of 20.46 Kmpl. This vehicle can reach a top speed in the range of 150 to 160 Kmph and can break the 100 Kmph barrier in just a matter of 12.5 seconds. This latest trim gets hydraulically operated diagonal split dual circuit braking, which is highly reliable. Its front wheels are equipped with ventilated discs and the rear ones have been fitted with drum brakes. It is further enhanced by anti lock braking system in combination with electronic brake force distribution, which keeps the vehicle stable on any road condition. With a minimum turning radius of 5.2-meters, its electro hydraulic power steering system makes it simpler to drive. As far as the suspension is concerned, its front axle is paired with independent McPherson Strut, while the rear axle is paired with torsion beam. In addition to these, the company has also added coil springs and anti roll bars, which further augments the suspension mechanism. The Renault Duster 1 Lakh Edition trim is bestowed with all the aspects that are incorporated in the RxL Plus trim. It is blessed with exclusive features like an infotainment with steering mounted audio controls, Bluetooth telephony and USB connectivity, rear wiper and defogger. This limited edition trim also comes with features including power steering system with tilt adjustment, air conditioner with heater and pollen filter, electrically adjustable outside mirrors, foldable rear seat back rest, rear centre armrest with cup holders, accessory power sockets, on board trip computer, headlight alarm and several other such aspects. It also features a large glove box unit, trunk room lamp, front map lamp, digital clock, passenger vanity mirror, bottle holder on central console, two cup holders and so on. The car maker is offering this trim with few additional safety aspects like anti lock braking system, electronic brake force distribution and front fog lamps. In addition to these, it also has dual front airbags, brake assist system, engine immobilizer, central locking and engine protective under guard, door open warning lamp, rear defogger, wiper and washer. 1. Fuel economy is very impressive. 2. Good comfort and safety features add to its advantage. 1. Price range can be more competitive. 2. Presence of service stations must improve.